Now that PDFs of the Necromancer Games 5E books are rolling out, I finally have time to write some of the previews that should have been done, oh, four months ago while the Kickstarter was still running. Reviews of Fifth Edition Foes have been very positive, and let me tell you, it's great to hear strong reviews after so many months of work. Offered here is one monster from 5EF that illustrates some of our approach. I won't say the bone cobbler typifies the book, because no single entry can be "typical" of a book containing 252 monsters. It's an example of how we went for monsters with strong story implications and with the potential to become far more dangerous than their raw numbers imply, in the hands of a GM who respects those story angles. 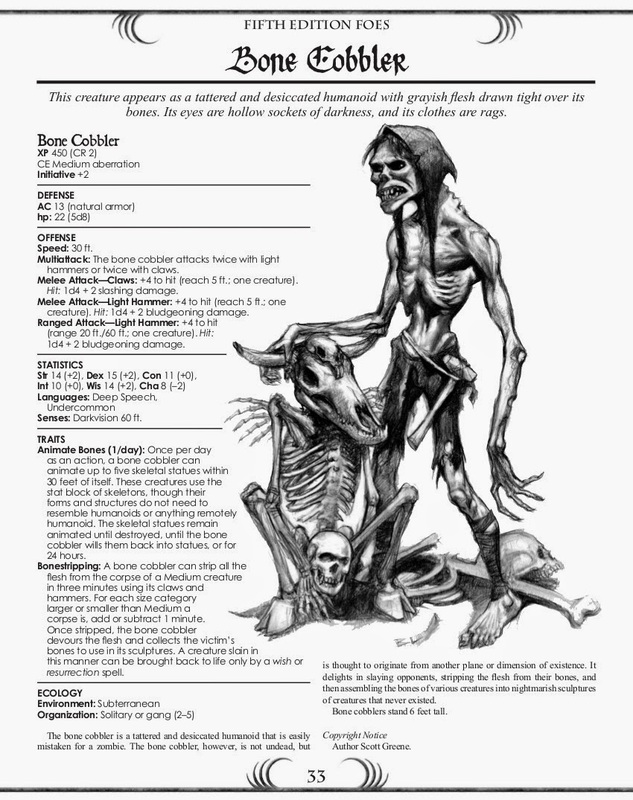 The bone cobbler doesn't belong on anyone's random encounters table. This is a creature that deserves to have an entire short adventure, or at least a detailed lair encounter, devised around it. Animate Bones is a great cinematic ability, and Bonestripping should put fear in the heart of every low-level adeventurer. If this thing gets you alone for four minutes, you aren't just dead; you're gone beyond hope of recovery by much of anything short of divine intervention. A GM who uses a bone cobbler needs to construct its lair like the set of a black-and-white gothic horror film, with plenty of secret doors that victims can be pulled through after all their companions have marched past, or trap doors that open silently under the last person in line and drop them into the bone cobbler's lair, where they're finished off by horrific skeletal abominations. The victim's friends have three minutes to recover the body, which is a tall order considering they probably don't know where it is and might not even know that the person is missing, if the GM did things correctly! In other words, the bone cobbler is a ready-made Jeepers Creepers horror-movie villain waiting to be sprung on characters. Just as important, however, is the fact that Fifth Edition Foes doesn't explain all of that for you. You might think that's because of space restrictions in the book, or is just laziness on our part, but in fact, we prefer to leave things like that unstated. Why? Because it's more fun for GMs to figure out for themselves. We believe GMs enjoy thinking about these sorts of things; why else would they be GMs? A book that does all the readers' thinking for them robs them of all those delicious "aha!" moments. Possibly worse, it assumes that our creativity is better than yours, and that's beyond deflating, it's an insult. So that's a brief introduction to some of the philosophy underpinning Fifth Edition Foes. If you didn't get in on the Kickstarter, you can still buy the book in hardcover + PDF or just PDF through the Frog God Games website. 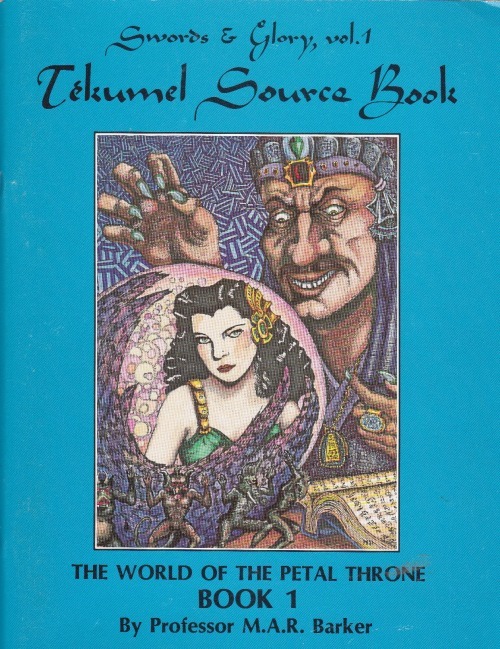 The book has quite a few reviews at ENWorld and also has an extensive discussion thread there, and Sobran ran a multipart look at the book and some of our CR assignments on his Fantastic Frontier blog. In coming days, I'll look at more of the monsters I found most interesting in 5EF, plus Quests of Doom and Lost Spells, of course! I couldn't agree more with the preview - the Bone Cobbler is the first monster I've built a lair around in the current campaign. It's fantastic. He is nastier than a deathmaster with a tub of corpse animating herb water but its okay. A Wizard can still reincarnate the remains.